In my most recent visit with my Psychologist, she told me she wanted me to try and unify Cadence with my male alter ego. I had spent years telling myself I had done that very thing. However, apparently I had done just the opposite. In a way, I was a one person variation on the theme of the movie, Twins with Arnold Schwartzennegger and Danny Devito. I had somehow relegated all the positive aspects of who I am, and invested them in Cadence, while my male alter ego was left with mostly the negatives. I conned myself into thinking that Miss Girlfriend was getting a mix of things from me, because of Caden; that there was a distinctly defined feminine benefit to Caden existing as a part of me. That may have been partially true, but I still held things back; reserved them exclusivy for the enjoyment and use of Cadence. All the while getting frustrated when anyone referred to Cadence in the third person; as if I was suffering a split personality or identity. But truth is; I sort of was. I had self-imposed that division on myself. I felt like there had to be distinct differences between Cadence and my male identity. In some small ways, yes; by all means. But not in the greater scope of things. There should not be a definitive reason for Cadence to be happy and enjoy a positive life experience at the expense of my male side suffering for her enjoyment of that luxury. My male ID should be able to enjoy the same level of confidence I am able to enjoy and maintain as Cadence. I’ve surmised that I tended to divide and repress elements of who I am out of fear of discovery. Miss Girlfriend once told me that on the occasion of our first dinner date, she noted that my hand gestures almost had a feminine quality to them. I suppose little things like that were enough to make me self conscious enough to seek a division between my feminine thoughts, feelings, needs and desires and my masculine alter-ego. While simply walking, I made sure to walk as though I was wearing heels, I made sure to elevate my chin and smile pleasantly. I made sure to be extra polite and friendly. When in conversation, I was sure to be engaging and fun. People around me immediately took note. They commented on the new and improved me they were seeing and enjoying. It was immediately apparent to me that I had managed to severely cheat both myself and those around me who do not know Cadence exists within their lives. They had no way to know I was siphoning the best qualities of me away from myself and them to build and feed Cadence. Cadence, someone who on a good week only gets to physically exist for maybe eight hours a week. Which isn’t entirely true; I, me; I am Cadence. Whatever I express physically, I am the totality of the two visual aspects I demonstrate. The key element is the heart, mind and soul of me the individual, which brings life to the two visages that those around me get to see. By living as a unified individual, they still know Cadence, no matter how I may present. Those who know of only Cadence also know my male side. There may be subtle nuances to how I express my feminine side versus my male side, but they are just that; subtle nuances, not key elements. I was initially worried that undertaking this endeavor would somehow take away from my time as Cadence; that it would somehow take light away from what I experience as Cadence. The truth is; it was freeing. My time as Cadence was more fulfilling, more enjoyable. I had slightly less angst about “putting Caden back in the box,” but I still found myself wishing it did not have to happen; that I could live some slightly larger part of my life as Caden. When I have not been expressing myself as Cadence, I’ve found that I wish to be her even more. I’m not sure what the relation is there; but I’m glad it was not the contrary that I had been worried about, where I would want or need less time as Caden. But it has certainly made my time as my male side more fulfilling. I found mixing the two halves together, because we are what and who we are, I’m much happier. The truth is, separation of yourself is where the internal conflict begins. That is not fun. Blending the two personas isn’t bad, it makes you whole. Keeping them separate , well there isn’t any balance. It becomes one direction or the other. Hence there internal havock. there is no reason that if your in drab you still can’t feel fem and happy. Because that’s who we are regardless of clothing. I agree completely. I like who I am as a blended individual. I like me better. 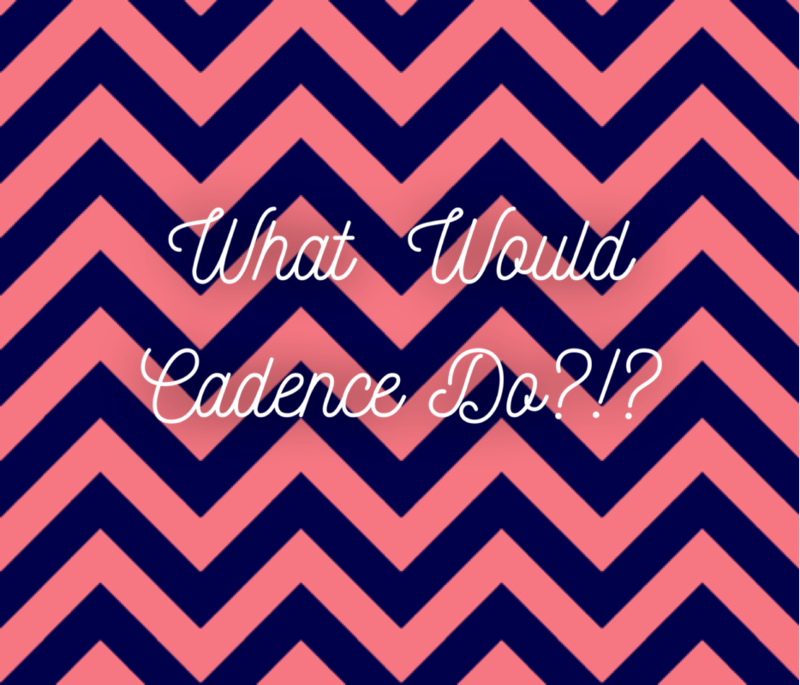 It also took some stress off of me when I am Cadence, because I’m not making up for a less than enjoyable life. There isn’t that tough emotional transition from drab to femme, because I’m not dressing so much to ease the stressors of my drab life; I’m simply dressing for the comfort and balance it brings me, and the closeness to my femininity that I get to enjoy. That in turns make my time en femme more enjoyable; because there isn’t that need to make up for the negativity of my male life. It becomes all about the positive…for the most part. I’m glad to hear. I’ve missed your posts lately. Hope to see more! I do not think I ever felt I was two separate persons. I am one person with various points of view and opinions that span a wide range and I have these views regardless of my attire. I am a Gemini so there may be an element of the sign of the twins but there are some kind and gentle aspects to my persona that would be deemed feminine and they are with me in male mode as well. I tend to think that we need to have an outlet for both manifestations of who we are. Good post and it is nice to see you back in blogville. Thanks Pat. I never felt I was two people, in fact I felt quite the opposite. However the problem was that while I was deluding myself that I was living a very blended life, in all actuality, I was denying my male side and punishing my male side; for essentially not being my feminine side. I was punishing myself for not being Cadence all the time, and I was self perpetuating things that made me resent my male life. Don’t get me wrong; I still resent my male life. It’ll never quite be my life as Caden. But I do not resent my male side for the negativity that seemed to fill that facet of my life. Glad to be back. Had some family illnesses that seriously hampered my ability to dress, which tends to hamper my desire to write about Caden issues. Also had a rather long bout of PTSD nightmares, because I couldn’t dress as Caden. Caden is a serious treatment channel for my PTSD. It seriously diminishes the duration of my PTSD nightmare cycles. Which makes me question why and how it comes to have such a powerful result. Wonderful to have you back! I always enjoy reading your posts. The duality of male and female modes has been draining for me, as well. Although, mine is manifesting in a much different way. I am happier as my female self, and while I see myself as one person, I have found through much soul-searching that I am feminine at my core. To that end, I will be going full-time very soon! 🙂 This will allow me truly express the blended me for all to see, not just a select few. It has been terribly draining keeping my secret from the world. I am confident that most people will continue to see me for me—just a happier and more balanced me. Once I get through the bumpy consequences of coming out as trans, I look forward to better days. Like you, I do not resent my male tendencies. They will always be a part of me. But my femininity dominates my thoughts and heart, and I can no longer deny that. The dual lives has been tearing me apart. Now it’s time to unify them and be the authentic me.